Well done to all the year 6 pupils that have completed their SATs exams. Thank you to the pupils for working so hard and for the support you have given at home. We hope that they had a well-deserved break this weekend. Most of the year 2 SATs are also completed and they have also worked very hard. Other pupils have also completed assessments in class to confirm the teacher’s knowledge about the pupil’s understanding on particular subjects. This information can then be used to target specific groups with support and consolidate learning during the last term. We are all looking forward to a busy term 6, with various activities planned and interesting class topics it should be a great end to the school year. Please do take time to look on the school website for the Programme of Work for each Class to find out what the pupils are learning in school. Pupils enjoyed a day of activity and fun last Friday during Try a New Sports Day. Pupils were in mixed age groups and completed a variety of different sports throughout the day including cheerleading and tennis. With this in mind please could you ensure that your child has a sun hat in school and sunscreen should be applied before school. Sunscreen (labelled with your child’s name) can also be brought into school for them to reapply. In hot weather we also encourage pupils to drink plenty of water so please send your son/daughter to school with a named water bottle. Could we remind all parents/carers of our uniform policy and ensure that pupils come to school in the correct uniform. All pupils should have their PE kit in school at all times. Many thanks. The school hall can be a very noisy place during lunchtime. In an effort to reduce the noise and make eating lunch a more pleasant experience for the pupils we are trialing a new lunchtime system. This will mean that pupils queuing for their cooked meal do not have to wait for as long and pupils leaving the hall can go out to play sooner. There is also a reward system in place for those that are quiet and polite. Instead of a whole class entering the hall at once, the pupils are going up in smaller groups meaning that they have less time to wait for their food and more time playing with their peers. Many thanks to those who keep their ParentPay accounts in credit. It is very easy to run up a large debt on the system if your child has school meals daily and attends Before and After School Care. It is unfair on the pupils if school funds have to be used to cover debts before they are cleared. Please could you therefore ensure that your ParentPay account is in credit and meals are paid for in advance? We would really appreciate your help in this area. If you are in receipt of certain benefits you may be eligible for Free School Meal Status (from reception to year 6) please apply online through the Gloucestershire County Council website. All pupils are taught about internet safety as they use the devices within school. We also ask that parents/carers enforce internet safety at home. Information is available on our school website and the local police support the school in offering advice and guidance to pupils. Class 4 recently watched a performance of the play ‘In the Net’ which informed pupils of internet safety in a child friendly way. Thanks to Friends of the School who supported this event. Pupils will be updated with the latest in internet safety from the local police on 10th July. There is a talk for parents/carers to be held in St George’s Hall at 2.30pm on 10th July. This should last for 30 minutes and keep you informed about the latest dangers in the online world. Please add the date to your diary. A group of pupils are visiting the MOD in Kineton at the beginning of next term as they qualified for a competition to fly their design of paper aeroplanes. Good luck for the race! Pupils will walk down to St Peter and St Paul’s, Blockley, in class groups during the week beginning 11th June. They will then participate in interactive workstations informing them more about the church. The school photographers will be in school on 14th and 15th June to take class photographs. These will then be available to purchase. 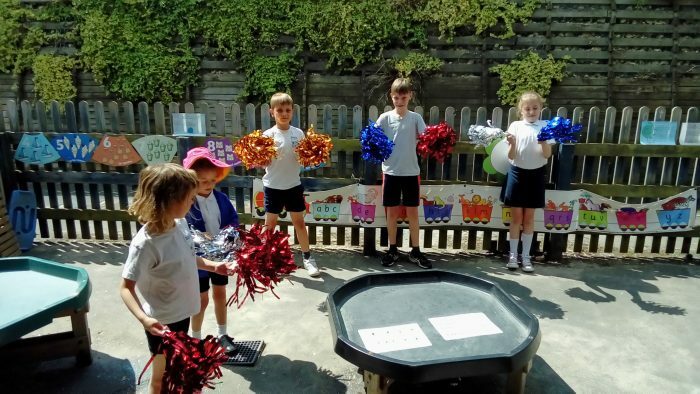 Following the success of last year’s sports day and feedback from pupils after the event we are holding this year’s sports day at the Prince of Wales Stadium. This will take place on 19th June and letters regarding this will be out this week. To cater for all pupils and families sports day next year will be in Blockley. Many of us have to drive to school and therefore at busy times Park Road outside the school can be very congested. Please drive carefully and be respectful of the residents who live both on Park Road and along the Landgate and ensure that they retain access to their properties at all times. Please keep an eye on our school website where dates of forthcoming events will be posted. Every day during evensong at the Cathedral a particular part of the Diocese is remembered in the prayers. On Tuesday 12th June it is the turn of Blockley School when the school community will be prayed for. The service, sung by the Cathedral Choir, starts at 5.30pm and lasts for about 40 minutes. We wish you an enjoyable and relaxing half term. Please remember that school starts for the pupils on Tuesday 5th June. An Open Door Service is taking place at St Peter’s and St Paul’s Church, Blockley on Sunday 3rd June 2018, 9.30am. This is an all age service with breakfast. Please join us, everyone is welcome.